The Year End for 2018 is almost upon us, so Stampin’ Up! are having a Year End Closeout Sale! The retiring list for the Autumn-Winter catalogue has been released, and this is your last chance to get your hands on some of the seasonal goodness contained in there! All these items are now while-stocks-last, and some of the items in there had already sold out – so don’t hesitate if there are items you want! Some supplies even have a discount applied now, so are even better value for money. The retiring list is here: Year End Closeout-UK and is valid as of today, December 6th, when I am writing this post. 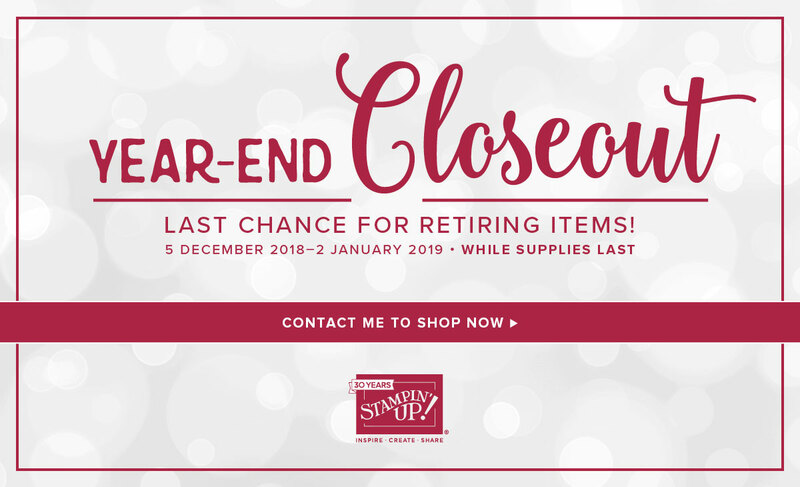 Alternatively, you can go to my online store and visit the Year End Closeout sale pages to see the current in-stock items. Shop here with Deep Blue Crafting. There are two items from the Annual Catalogue which have been included in the Year End Closeout, and these are the Simply Shammy, which is perfect for cleaning all of your stamps after using them – particularly the photopolymer ones; and the Red Rhinestones which are ideal for your cards including Christmas, Valentines, Birthday and anywhere else which needs a bit of sparkle added in rich red! These items are being sold at a discount during the Year End Closeout and they are not retiring or while stocks last, so they will be available throughout the rest of the year. So it’s well worth stocking-up if you use a lot of sparkles on your cards. I like to have a shammy with me in a plastic stamp case as nothing else is required to clean your stamps while you are out and about. No mess and clean stamps – I love it! So all that remains for today is for me to remind you to head over to the store or contact me to get your last-chance Year End goodies, or to stock up on the discounted bits you need for the new year. And to let you know to keep your eyes open for the class schedule and details. Get ready to schedule in some “me time” for the new year and reconnect with your creativity!